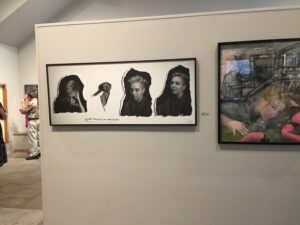 From parochial To worldliness, a 21 x 51″ work on canvas from the series, Scrapbook, Portraits in Context was selected for The Summer Show, the 53rd National Juried Artists Exhibition conducted by the St. Tammany Art Association. This annual competition of contemporary art is reported to be the most diverse in the SouthEast. 28 pieces were selected from 336 entries by 121 artists in 22 states. The juror, Katie Pfohl, Ph.D. is the Curator of Modern and Contemporary Art at the New Orleans Museum of Art. The St. Tammany Art Association was founded in 1958. Released in 2018, the piece in the Summer Show is from my latest set of stories, “From…To….” Each depicts transitions in emotion, mood, attitude and response due to life experiences leading to an inflection point, marked by the dried flower, when personality changes. The exhibition is from July 14th to August 18th, 2018 at the St. Tammany Art Association’s Miriam Barranger Gallery, 320 North Columbia Street, Covington, LA. The opening reception is on July 14th from 6 – 9pm. Shown below is a snapshot of the wood-framed artwork printed by me on archival canvas. To view this piece and the Scrapbook series on my Art page, click here. For gallery hours, directions, and to read about the exhibition on the St. Tammany Art Association’s website click here.